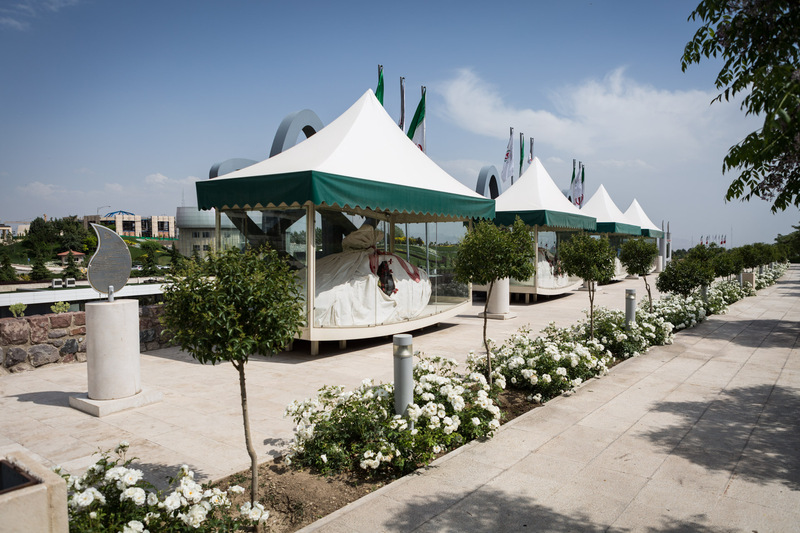 The Holy Defense Museum in Tehran, opened in September 2012, stands as Iran's biggest and most expensive museum today. The museum grounds also features a public park, 21 hectare in size. 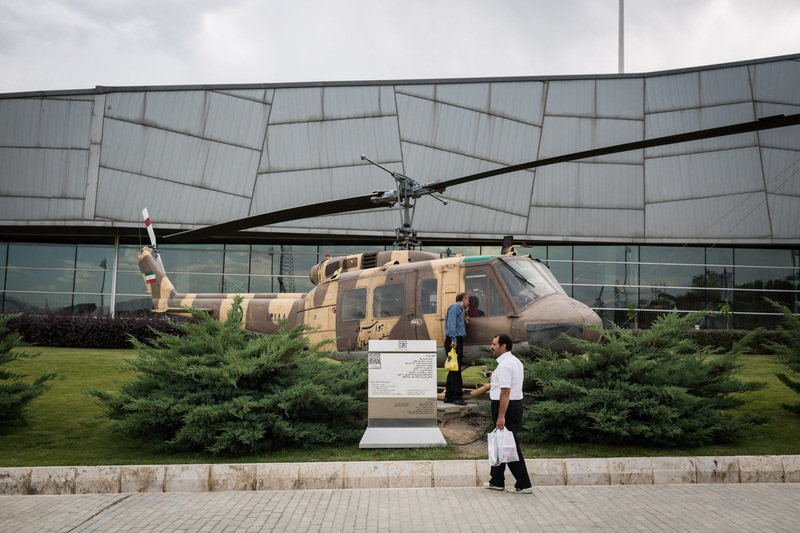 Two visitors of the museum inspect an Iranian helicopter, used in the Iran-Iraq war from 1980-1988. The first hall of the museum is called "Hall of butterflies". A guide explains that "butterflies are attracted to the light, and for the love of it, they go close and are consumed by it". 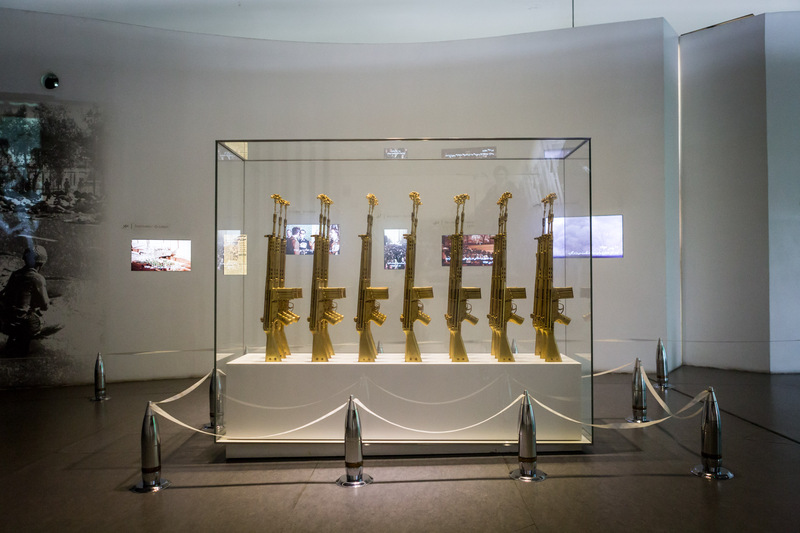 21 golden rifles with flowers in their barrels remember of the three weeks of peaceful demonstrations against the Shah of Persia before the Iranian revolution took place in history. 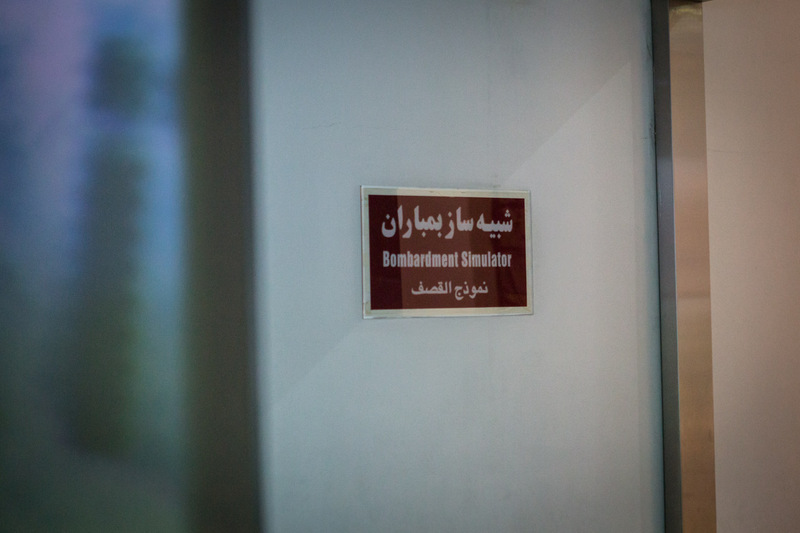 Designated for very old and very young participants of the war, a special room awaits visitors. According to museum information, Islam forbids to enlist young and old people in a war. If they are eager to participate though, one must not hold them back. 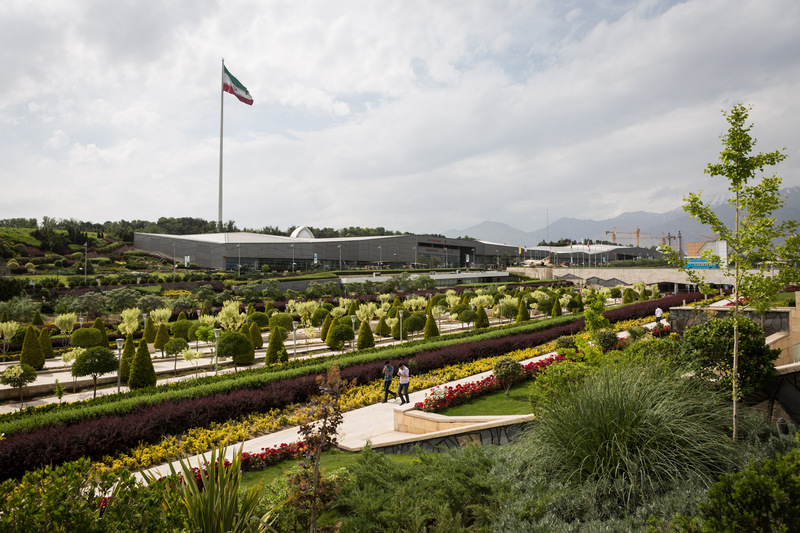 The Iranian government spent a lot of money to hire interior designers and museum artist for the country's major touristic landmark in the capital. 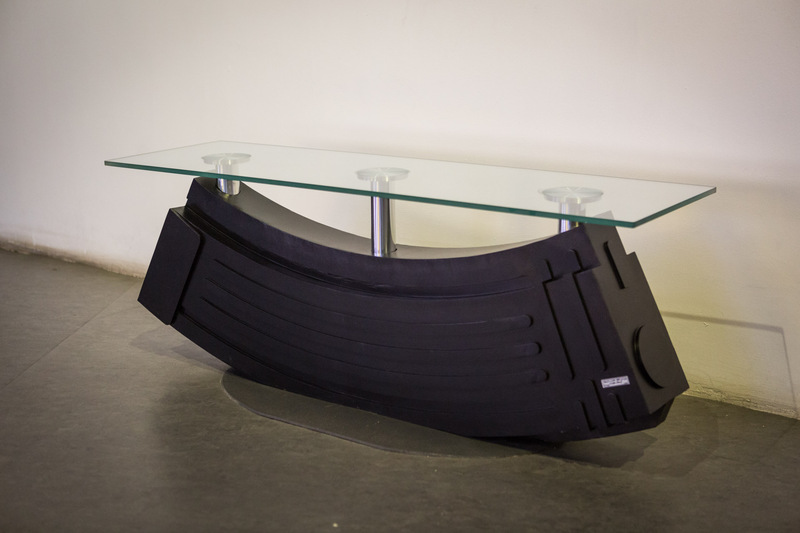 Here, a table was designed in the shape of an AK-47 rifle magazine. Historical fact sheets and several exhibits from the armoury in one of the museum's halls. 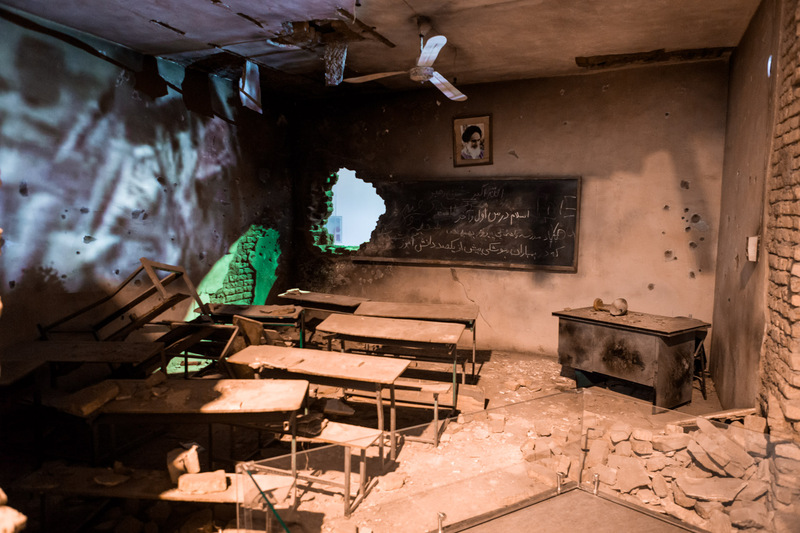 Devastated by Iraqi bombs, an old Iranian classroom has been set up, including a video projection on the left wall. A female guide in the museum is walking a class through a hall. 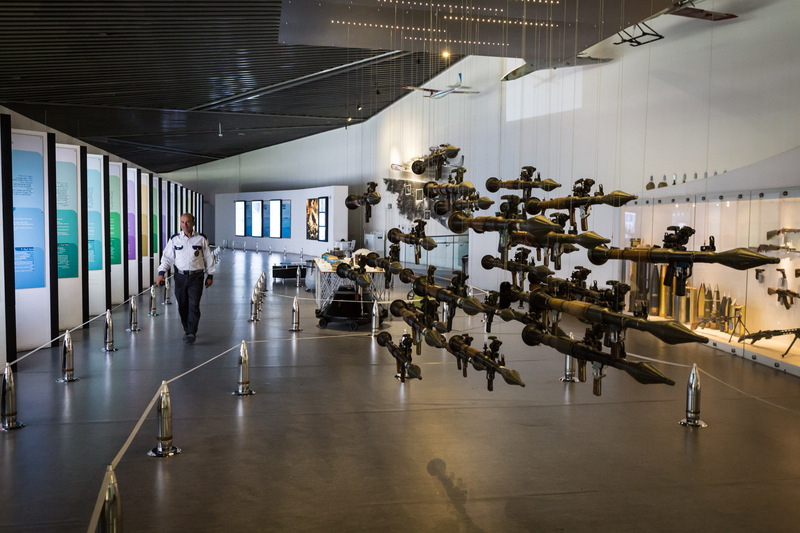 The museum blames western countries for selling weapons to Iraq and the United Nations for not sanctioning Iraq and calling the start of the war simply a "situation". This peculiar sign to the bombardment simulator may not win a price for creativity, but certainly for its uniqueness. A school class experiences the bombardment simulator. 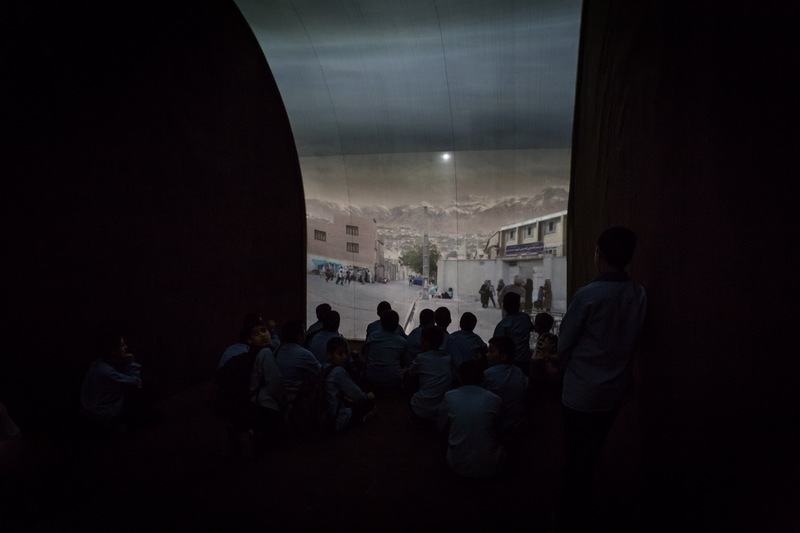 It features a vertical screen, showing an Iranian village, while Iraqi airforce approaches. Sirens roar, bombs are being dropped, and the whole room shakes and is engulfed in rumbling thunder. The final images show a devastated, burning market covered in corpses. 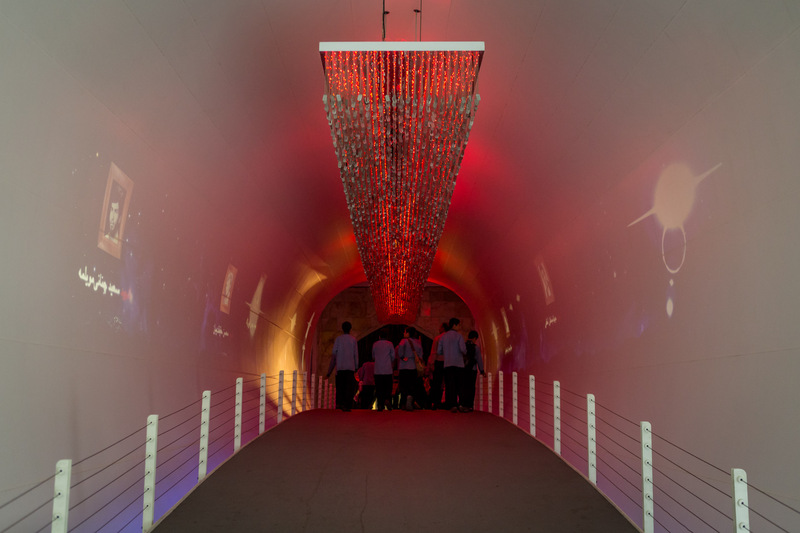 The bridge to the final hall - the hall of martyrdom - is illuminated in red, decorated with dog tags of martyrs of the war, and each side features video art showing photographs of Iranian martyrs ascending upwards, while turning into little stars. Metaphorically, the visitor takes a bridge into heaven. 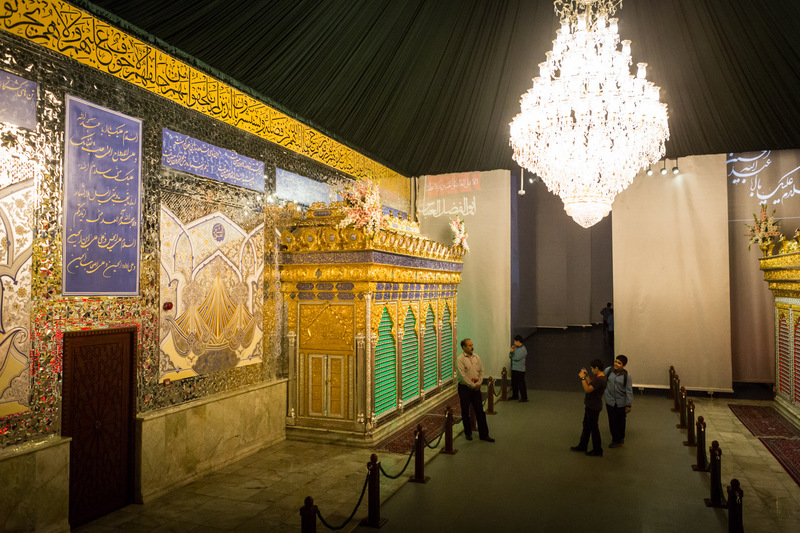 At the end of the bridge leading into the hall of martyrdom, a room representing paradise features two shrines, awaiting selfie-eager visitors. 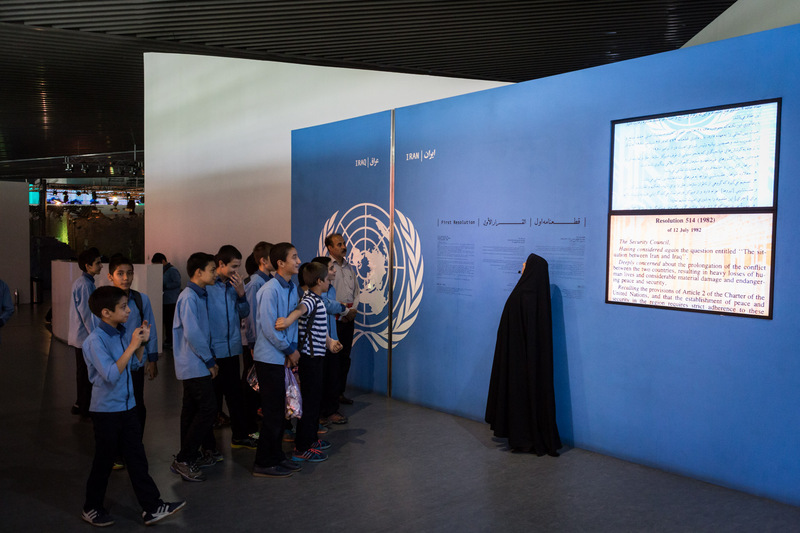 A male guide explains a video to a female class in the museum's hall of martyrdom. 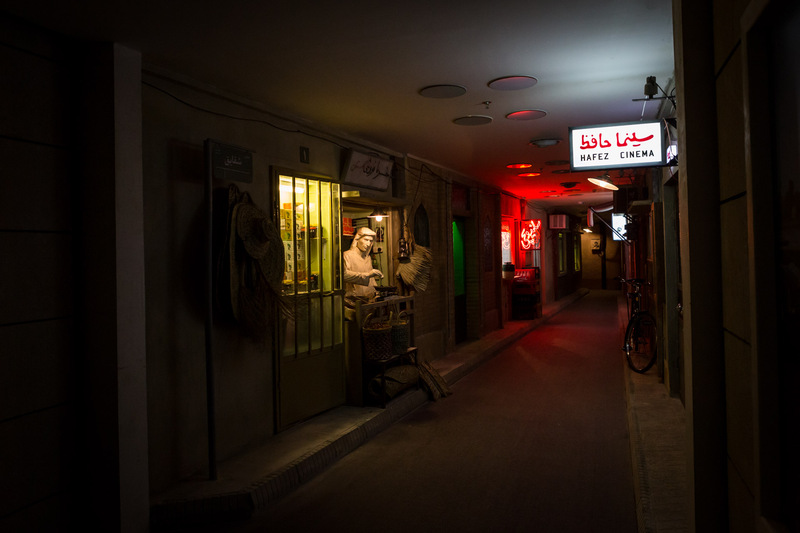 The blue signs in the back represent a Iranian village destroyed by war each. 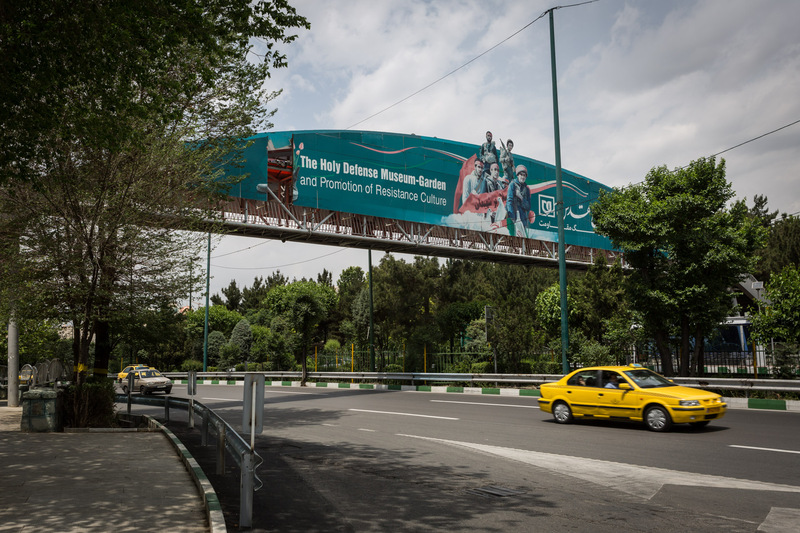 Art depicting the Holy Defense war is very popular in all areas of Iran. This section of the museum is still under construction. 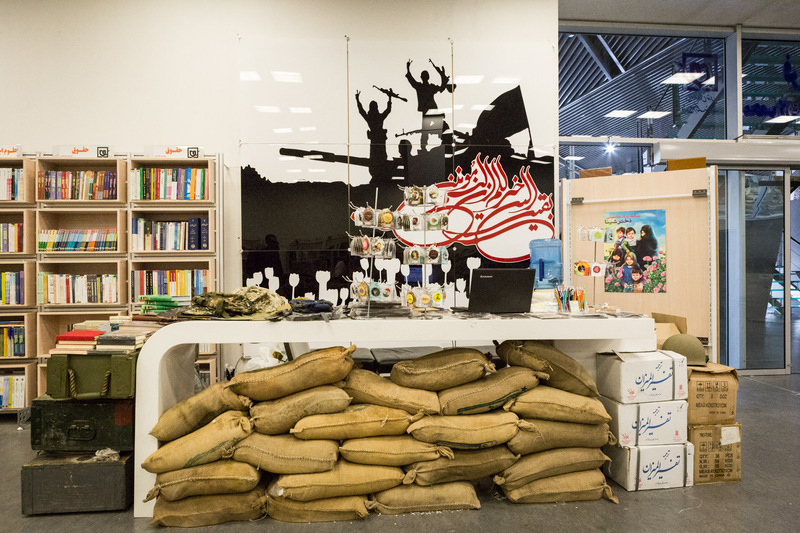 The counter at the gift shop of the museum is decorated with sand bags and war memorabilia. 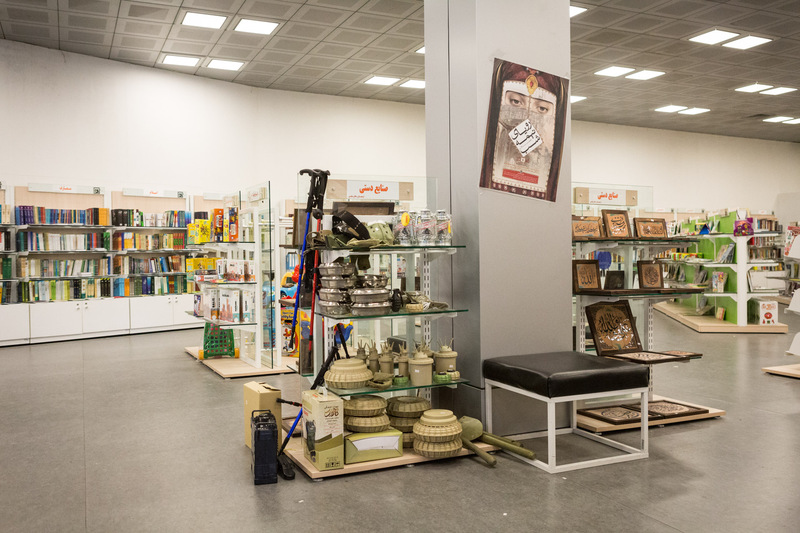 Copies of land mines serve as lunch boxes for shopping eager visitors of the Holy Defense museum. 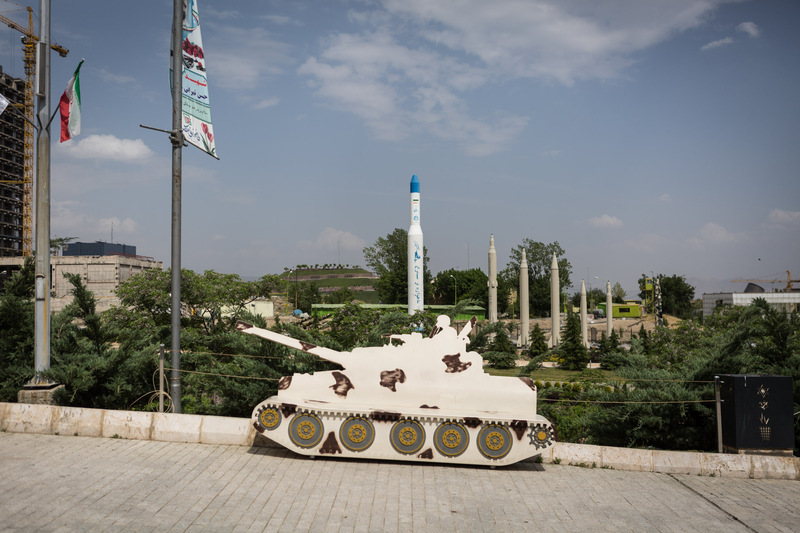 A bench in the public park outside the museum is shaped as a tank. A whole variety of long-range rockets is visible in the background. The cars of four nuclear engineers assassinated by car bombs in Tehran 2010 are wrapped like human bodies. In Islam, after death, bodies have to be covered in white linen before being buried. 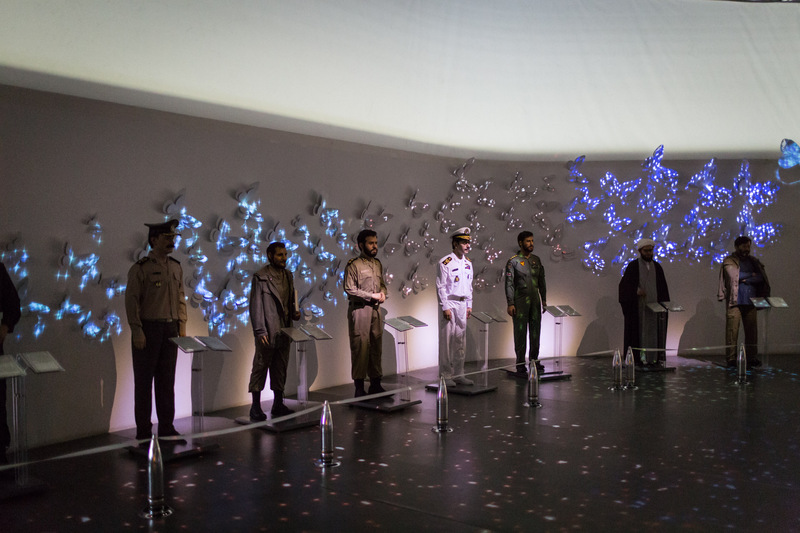 The engineers are regarded as martyrs and have obtained the status of national heroes. 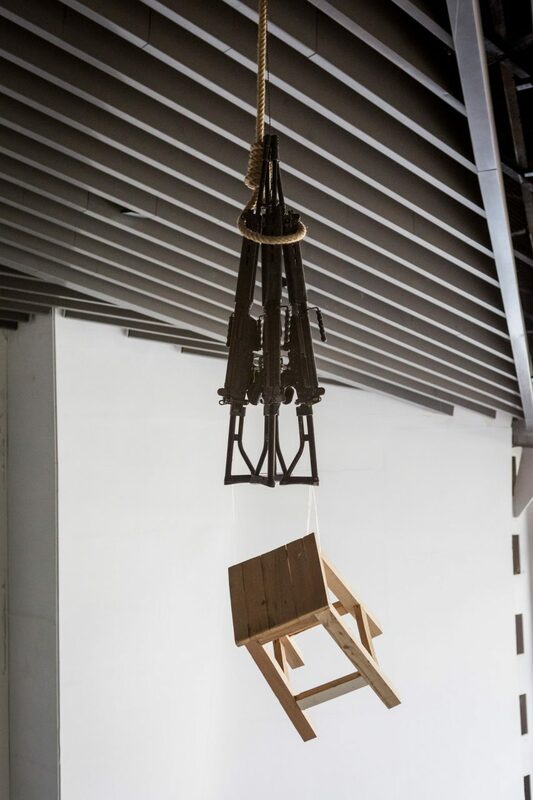 Three assault rifles have been symbolically executed by hanging. A small-scale copy of the bridge of Khorramshahr. The small city in the South-Western province of Khuzestan was the first one to be conquered by Iraqi army and was liberated by Iranian forces two years later. 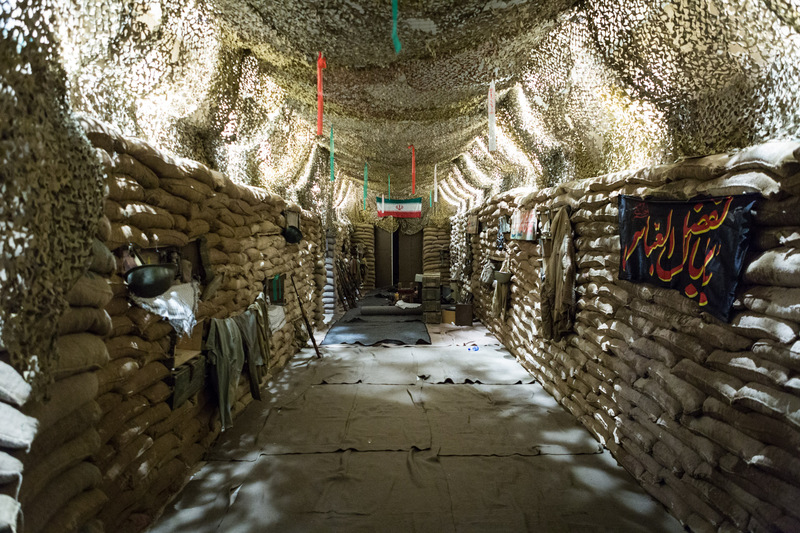 A re-enacted battle trench gives visitors a feeling of what Iranian soldiers had to endure for years. 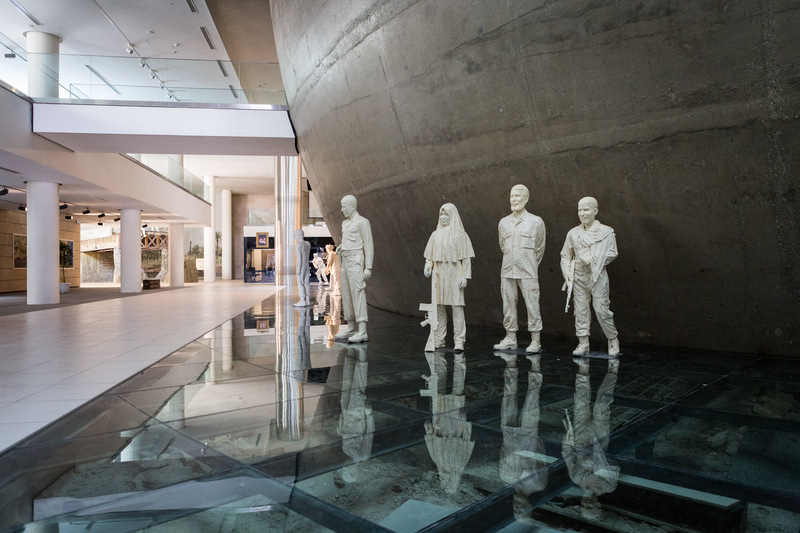 The museum honours all kinds of martyrs, including women, young and old combatants, the different ethnicities of Iran and even religious minorities like Jews. A street scene of Abadan, a city heavily devastated by Iraqi forces, shows what life used to be before the war. A merchant selling dates from his shop can be seen opposite a cinema. 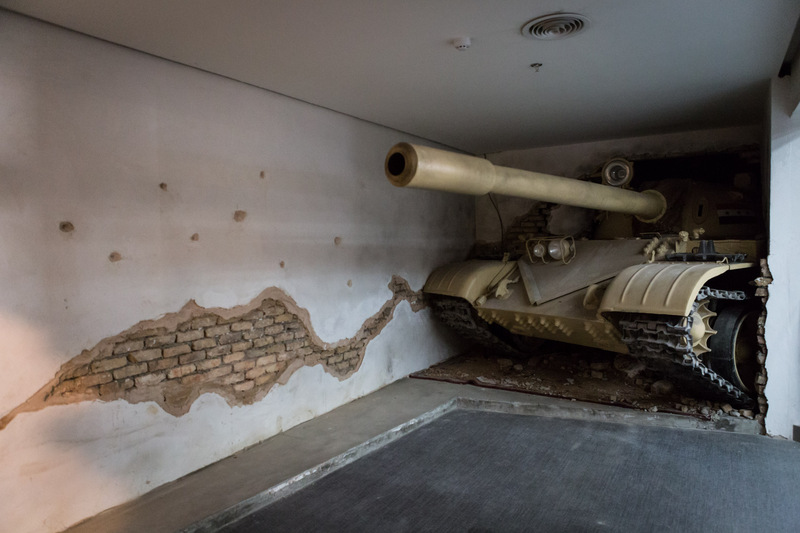 The front of a tank is breaking through a wall. 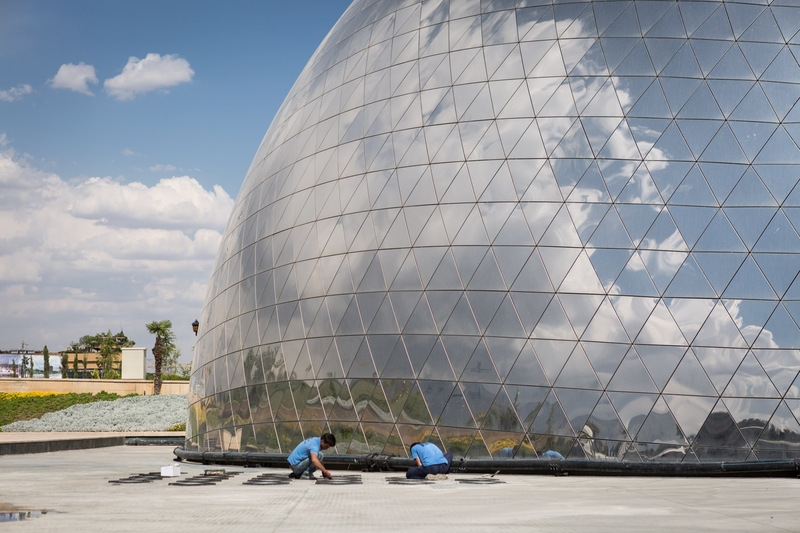 Two workers set their finishing touches to the dome which will feature a 360 degree panorama view of the destroyed city of Khorramshahr. 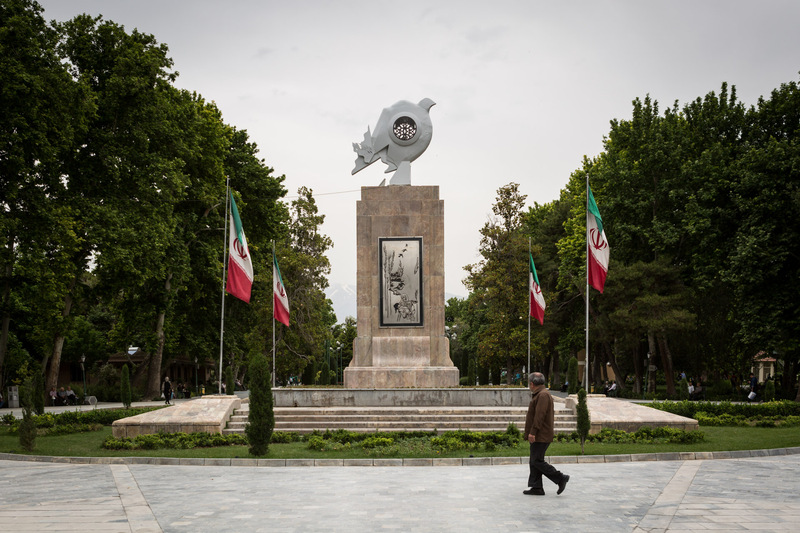 In Shahr park in downtown Tehran, a memorial reminds of the victims of the gas attacks on Sardasht on June 28th, 1987. 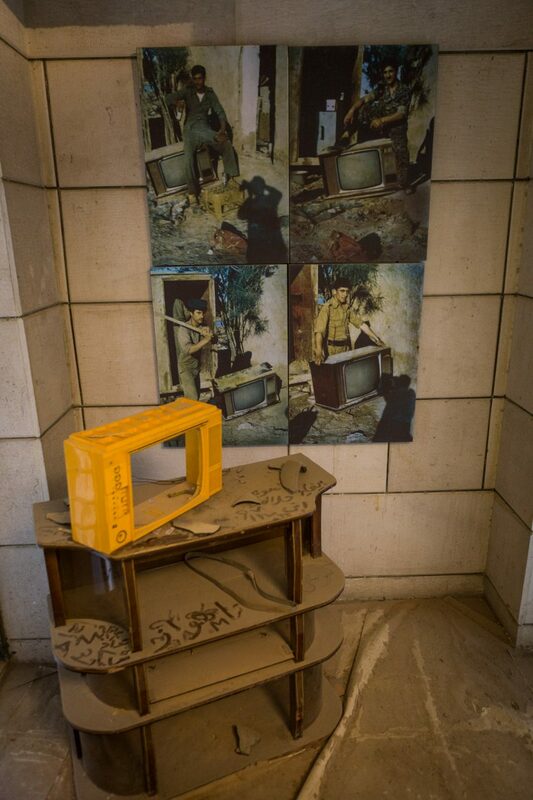 Sardasht was the first city being attacked with chemical weapons by Iraqi forces in eight years of war. 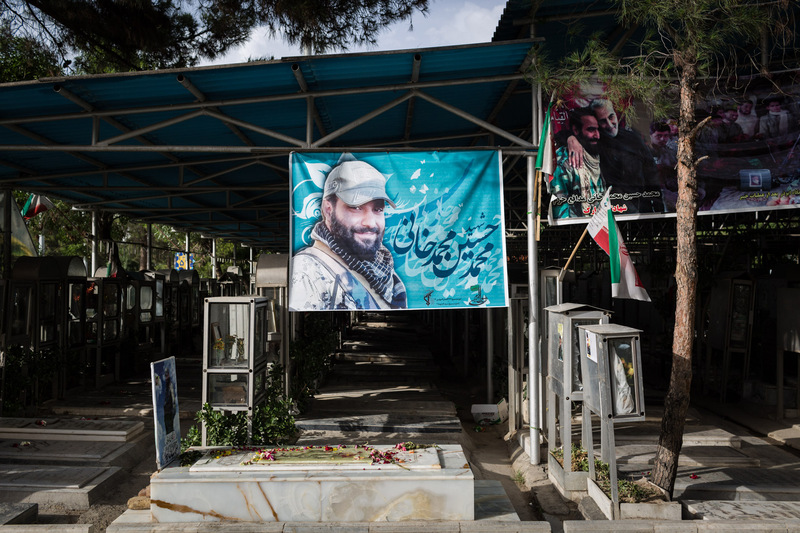 An Iranian soldier spends time at the grave of a fallen martyr. 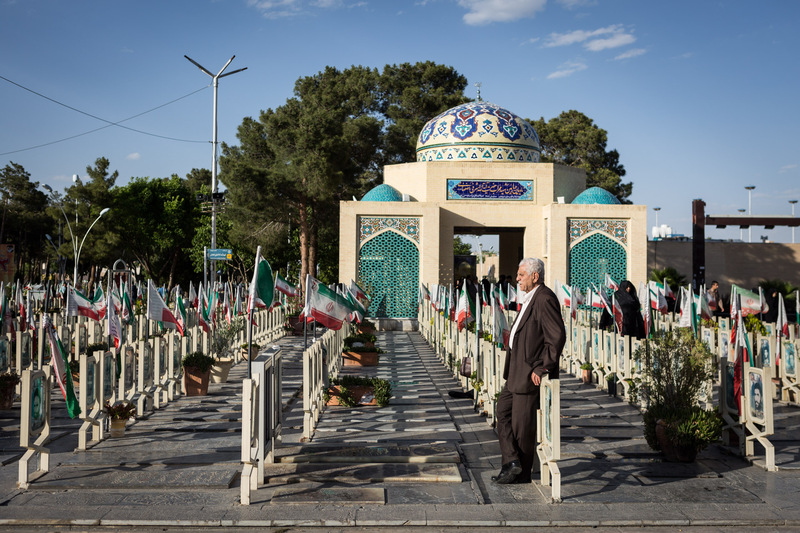 The cemetery of Isfahan is known far outside the city limits for its beauty and richly decorated martyr's section. On the border to Iraq, at the Shalamche border crossing, the Iraqi army set foot on Iranian soil for the first time in 1980. Today, in visibility of the border crossing, a shrine and a trench has been constructed to remember the beginning of the war. Nowadays the crossing serves for Iranians travelling to Iraq for pilgrimage. 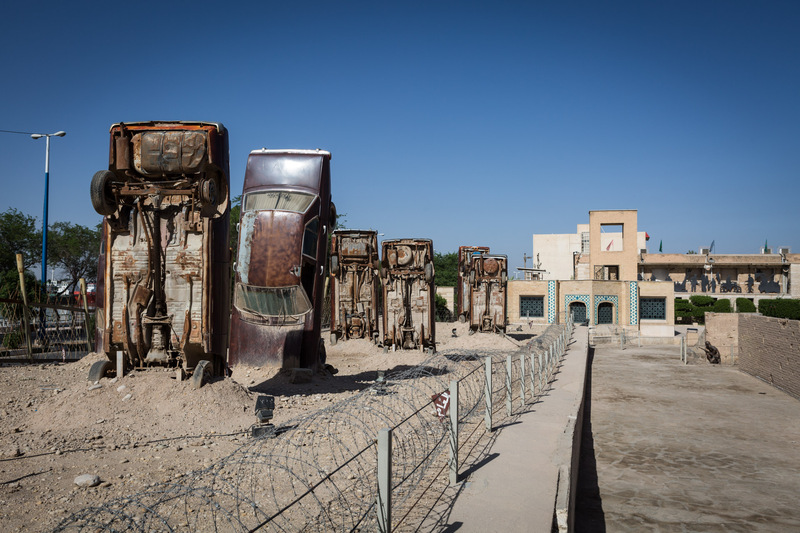 Cars have been struck in the ground at the Khorramshahr memorial museum. After the city was conquered by Iraqi army, they collected the remaining cars in the city and struck them to the ground in this way to prevent the Iranian airforce dropping paratroopers. 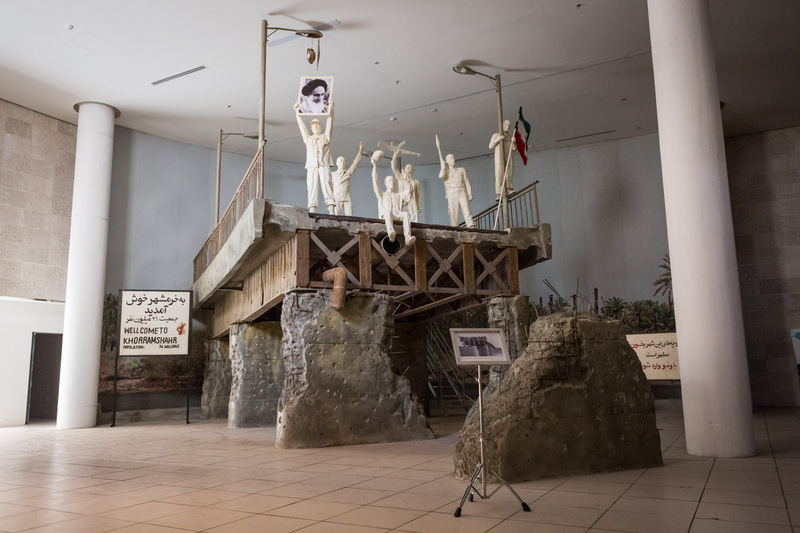 In Iranian museums, Iraqi soldiers are always depicted as a merciless force of infidels. Because Saddam Hussain's Ba'athist party was officially non-religious, the historical narrative in Iran portraits Iraqi soldiers as looting drinkers, and enemies of Islam. In reality, most of Saddam's soldiers were Shia muslims like the Iranians. 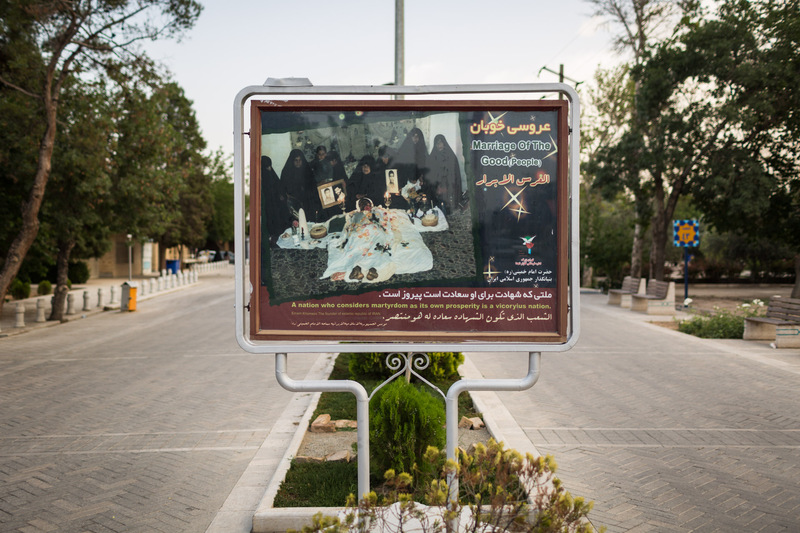 In a religious shrine in the province of Khuzestan, close to the former frontline, a billboard promotes martyrdom. 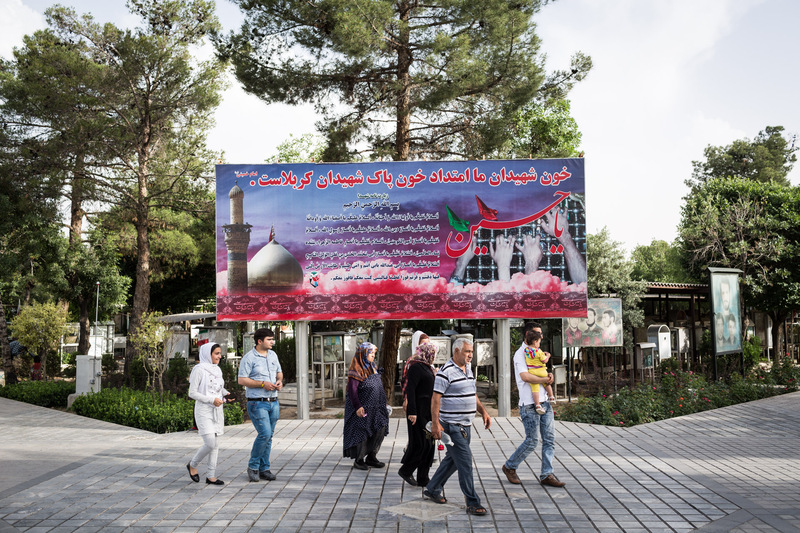 A group of people walk in front of a billboard reminding of martyrs on Behesht-e Zahra ("the paradise of Zahra"), Iran's biggest cemetery. Next to the section for martyrs, new graves have been erected. 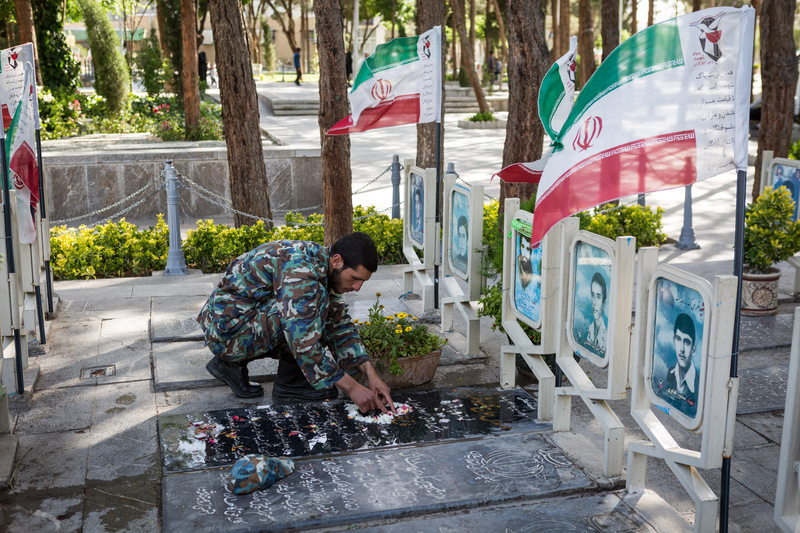 They serve as final resting places for the Iranian soldiers fighting in Iraq and Syria. The plate of a martyr's grave reads "Aleppo" ("halab") as place of his martyrdom. Three man pay their honours at the grave of a martyr. 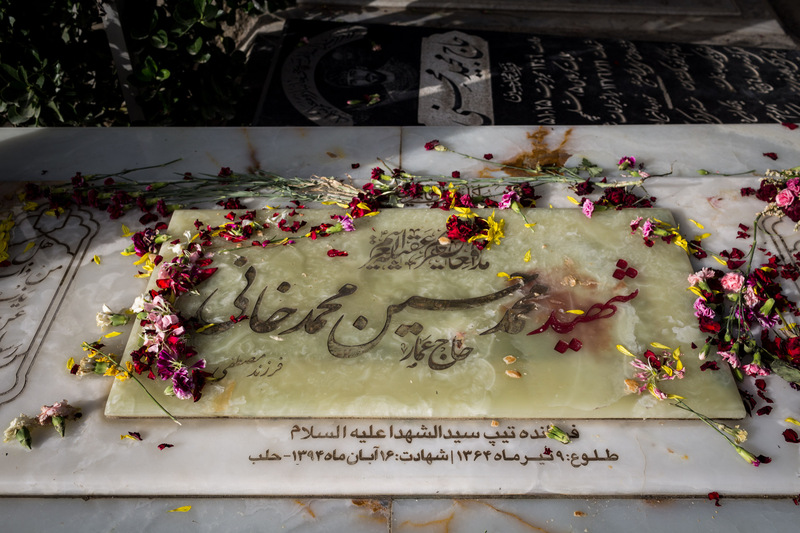 Behesht-e Zahra knows all kinds of martyrs. 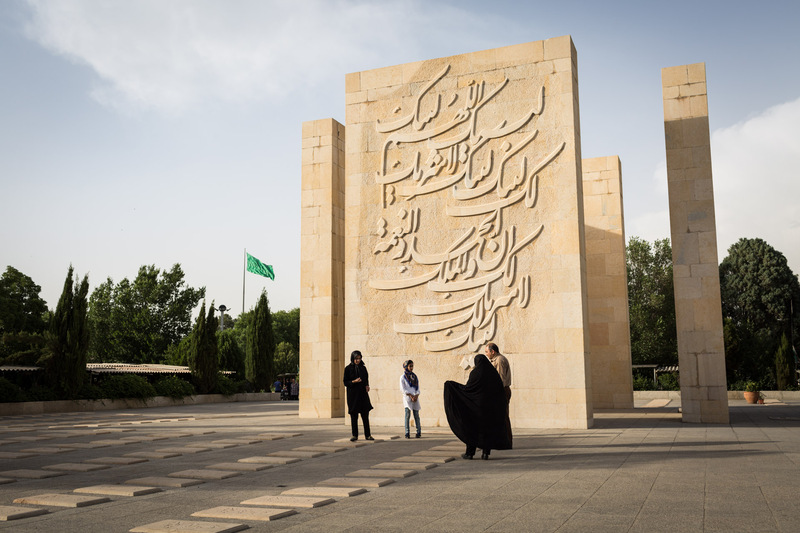 This monument is dedicated to more than 400 victims of the Mecca incident in 1987. "A nation who considers martyrdom as its own prosperity is a victorious nation." 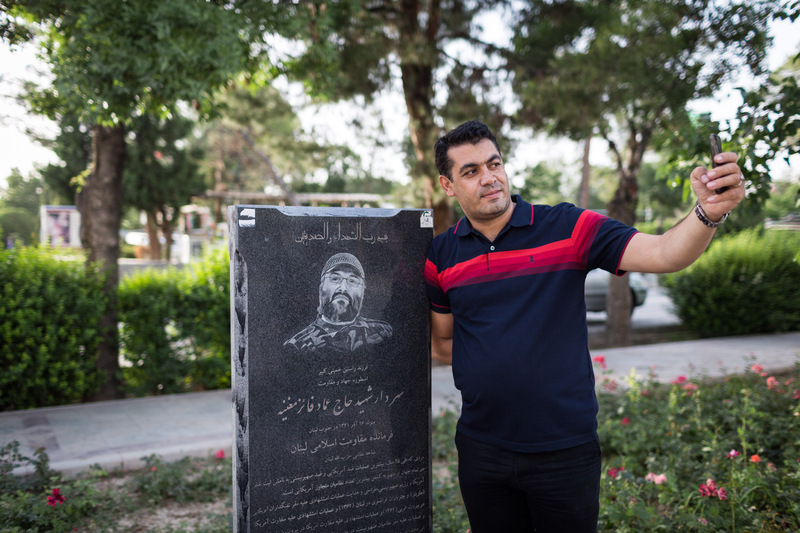 A visitor of the cemetery takes a selfie with a remembrance stele of Imad Mughniyeh, a member of Shia party Hezbollah, a close ally of Iran in Lebanon. 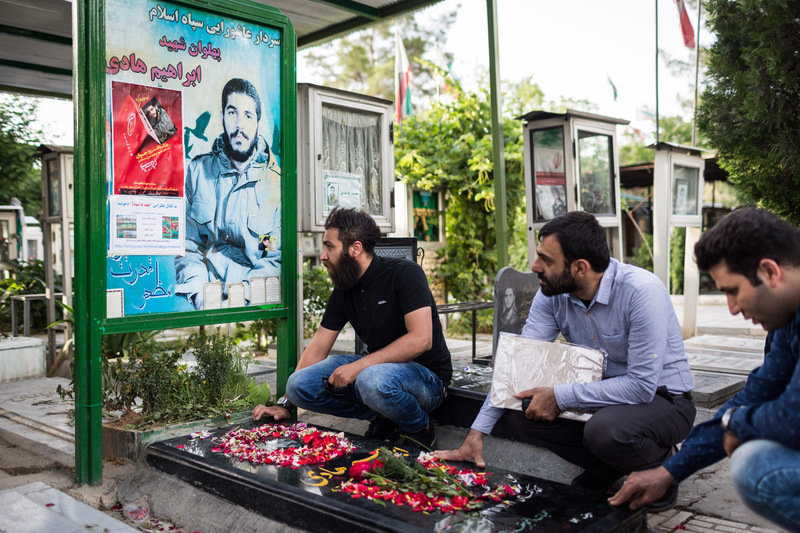 Mughniyeh was assassinated in Syria and is considered a martyr. 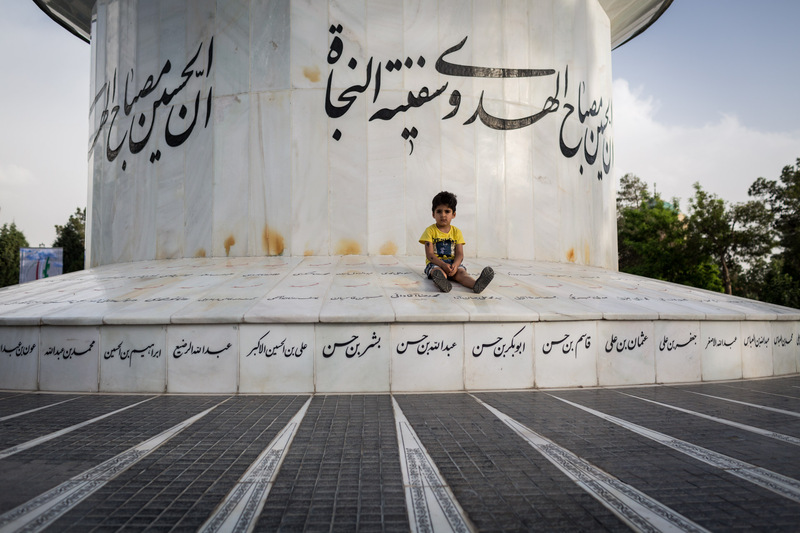 A boy sits on a memorial for members of the Iranian navy that have fallen in the war. 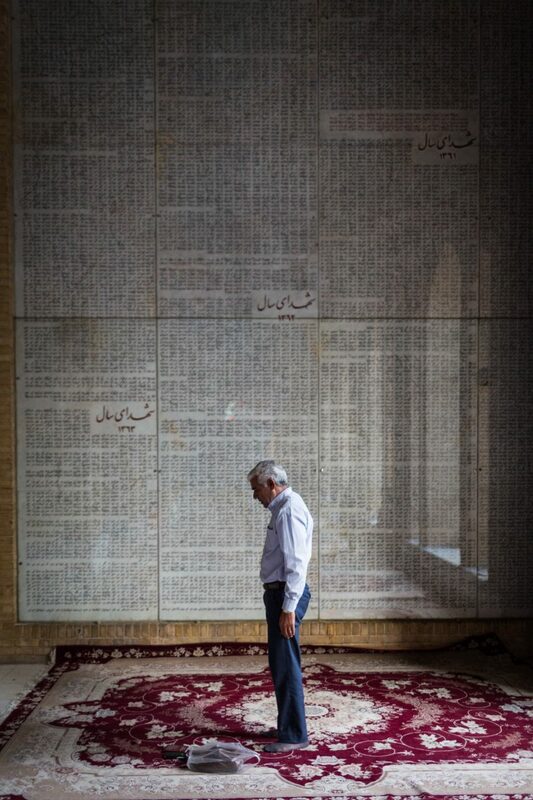 A man prays in front of a list with names of martyrs of the Iran-Iraq war. 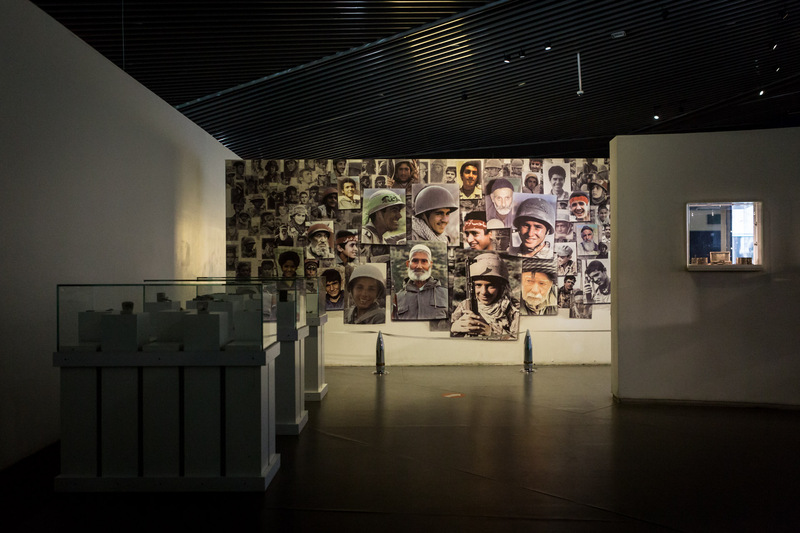 On Behesht-e Zahra, a man walks by a photograph depicting Iranian soldiers during the Iran-Iraq war. 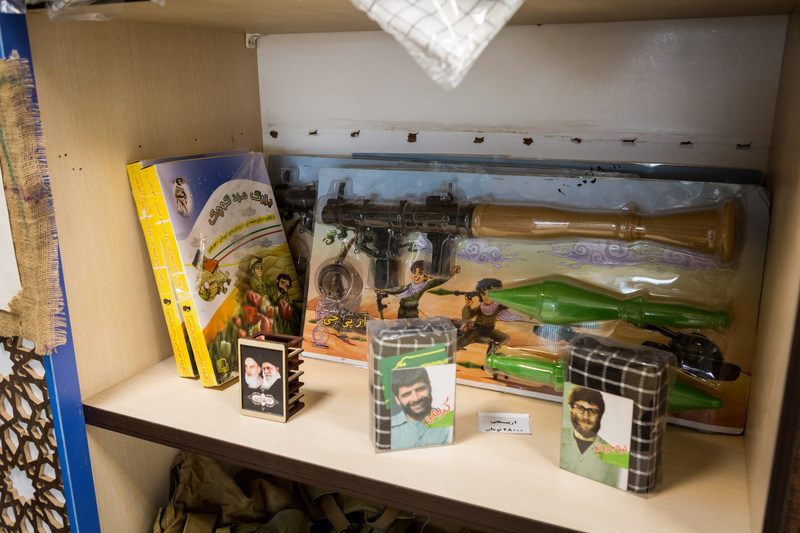 Various children's toys can be acquired for shopping- and martyrdom-savvy visitors of a shop in Qom. Products like these promote the idea of dying for your country and religion from a very early age on. Family funtime on a derelict tank from Holy Defense war. 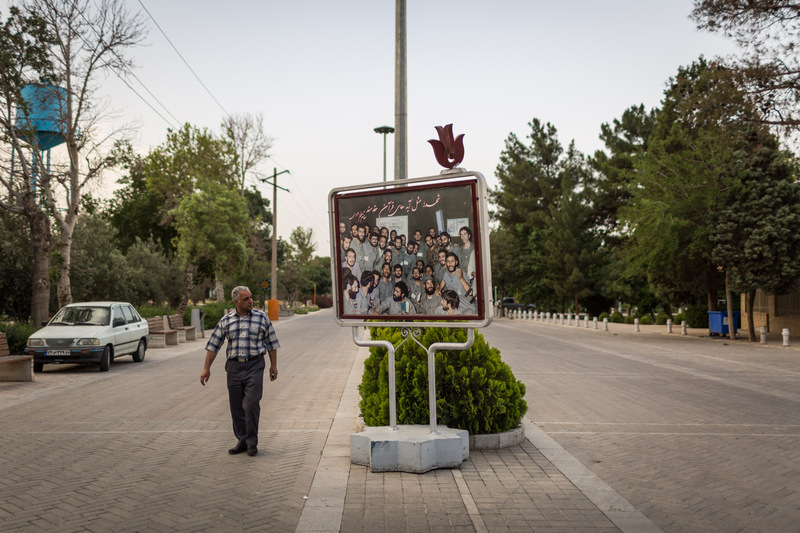 In the Islamic Republic of Iran, death has a long history. 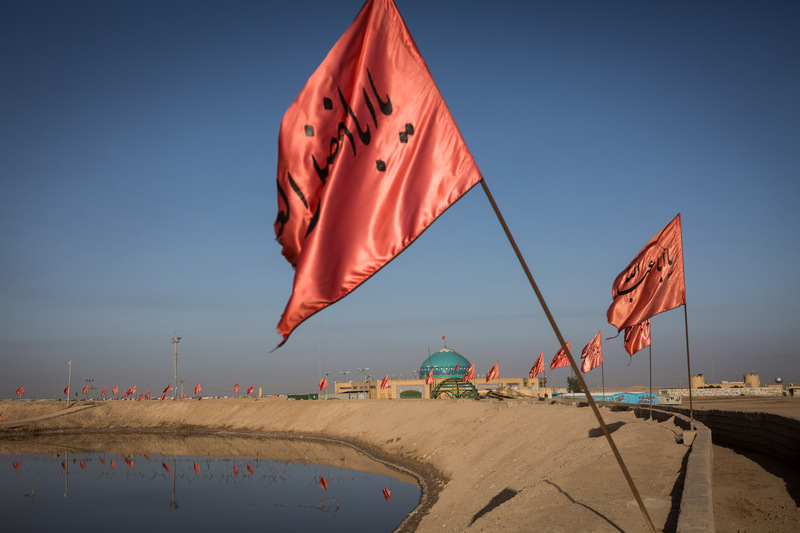 Martyrdom and death imprinted the very first moments of Shia Islam, when Imam Hussain was killed in the battle of Kerbala in 680. 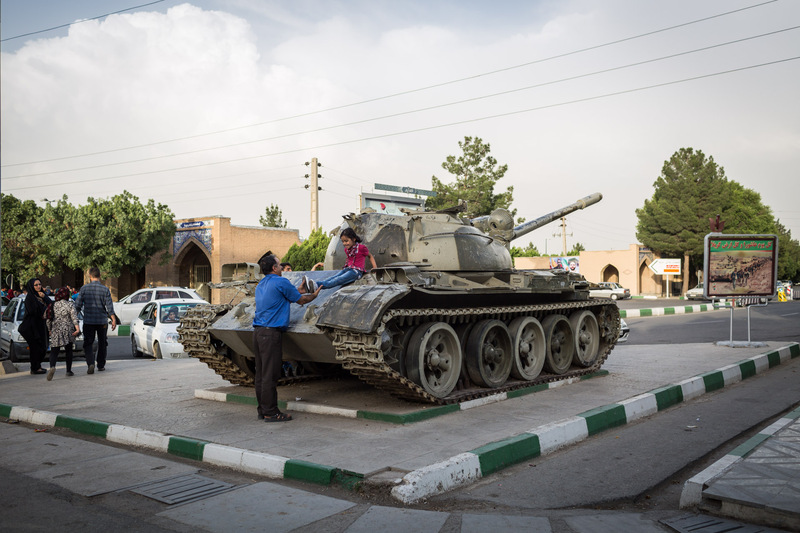 One year after the Islamic revolution – in 1980 – the young nation was gripped by a devastating war with its neighbour Iraq for eight years. In Iran, this war is called simply “Holy defense”. 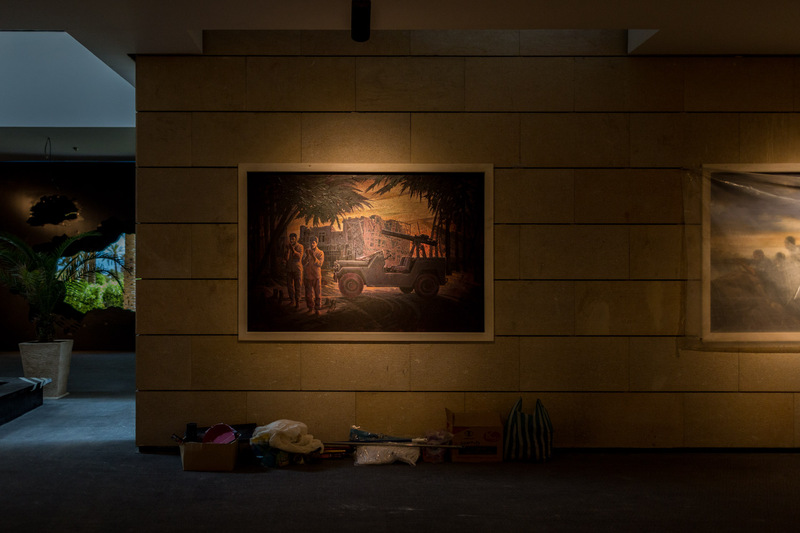 More than half a million people died, the war left the country traumatized until the present. The new government was able to defend the country under tremendous efforts, and with the help of thousands of young people willing to die for their country. Supreme leader Ayatollah Chomeini and his successors were able to shape the national identity from the ruins of the cities and the blood of its martyrs. The culture of martyrdom and remembrance is the foundation of the nation of Iran today. 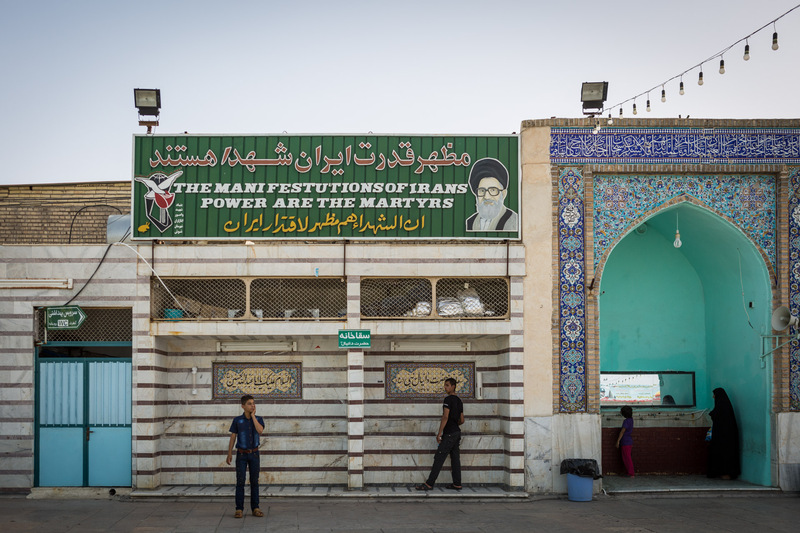 Its connection to the past is used for goals that the armed forces of Iran are trying to achieve domestically and abroad today – for the purpose of defending Islam in Syria and Iraq. 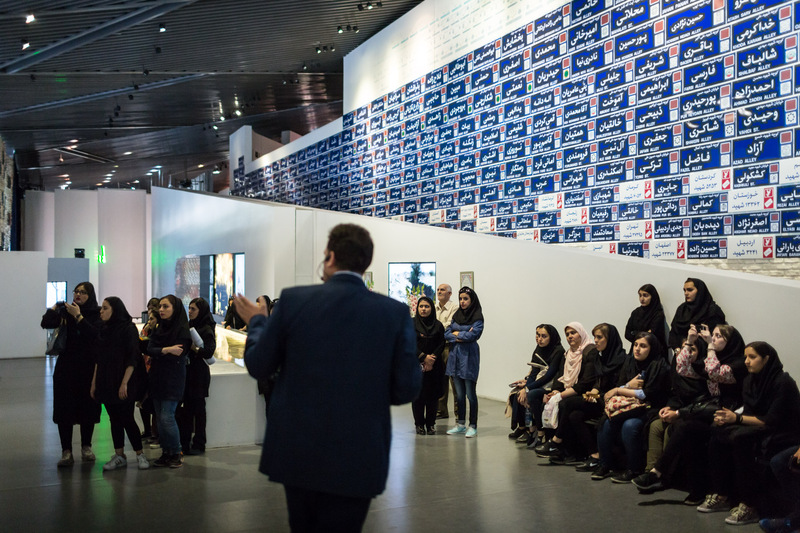 This photo-essay is the product of visits to places of history and remembrance to promote understanding of this culture in Iran.